Undoubtedly the most romantic and picturesque holiday beach resort town in southeastern Spain, the white-washed houses and cobbled streets of Mojacar are sprinkled atop a hill overlooking pristine sandy beaches, washed by the warm Mediterranean. The unspoilt ancient Moorish fortress town of Mojacar has been a favourite with artists and writers for many years, and now attracts holidaymakers who fill up the hotels and villas which have proliferated along the nearby stretch of beach, fortunately not yet to the detriment of the town's appearance or beguiling atmosphere. The village centre is honeycombed with narrow casbah-like cobbled alleyways, which hide many quaint surprises, like a Roman fountain pumping fresh spring water and the unusual fortified church of Santa Maria. Mojacar is the picture-perfect location for a beach holiday in Spain. The Commercial Centre is a large mall complex in the centre of town with every modern convenience. 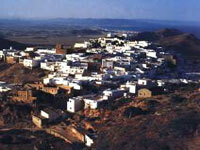 Adventurous and inquisitive tourists prepared to wander through the small alleyways of Mojacar will be richly rewarded. Many of the narrow streets have hidden treasures for dedicated shoppers, including small boutiques as well as a variety of holiday souvenir shops. Mojacar's restaurant scene consists of a varied selection of international eateries which complement its excellent Spanish tapas bars and local seafood restaurants. Restaurante El Antler in Calle Enmedio has been getting great reviews for over 25 years. Children are always welcome in Mojacar restaurants. Famous local dishes include caldo de pescado (fish stew) and pelotas (meatballs wrapped in dark green cabbage leaves). Visit the nearby town of Garuccho to sample their locally-caught red shrimp. The area on Mojacar beach known as the Brit Strip has numerous pubs and British themed eateries. The best selection of Mojacar bars can be found along the sea front, which is lined with good beach bars, offering happy hours, free tapas and splendid beach views. The larger hotels have lively bars and are worth visiting on weekends for those seeking a big night out. Along the beachfront are various operators offering horse riding, sailing, windsurfing, fishing and scuba diving in the surrounding area. There are currently 11 excellent golf courses around Mojacar, three of which are championship quality. The old town of Mojacar Pueblo is well worth a visit for the old buildings and cobbled streets, while the waterpark in the nearby town of Vera is a fun family excursion. This is a laid-back resort town with limited entertainment options for those wanting to spend their holiday in the town itself. The old town is accessible only by steep and narrow roads and is therefore unsuitable for people with mobility issues.